Why Does Your Business Need a Mobile Web Design Company? Did you know that while 20 percent of Google searches are now done from mobile devices, less than 2 percent of business websites are optimized for a mobile platform? The other 98 percent of websites are very hard to navigate on small smart phone screens, which can be a huge turn-off to potential customers. The number of mobile searches has grown 5 times over the past two years, and within the next few years, mobile searches will constitute the majority of all web searches. It’s very clear that mobile web design is an essential element of forward-thinking e-commerce websites. Mobile-optimized websites are the ones that that get found and used by potential customers who are on the go and ready to purchase. With the number of mobile searches increasing daily, you cannot afford not to enlist a mobile web designer to optimize your site for these on-the-go customers. If the estimates are on target, more people will be browsing the web on their mobile devices than on desktop computers by 2014. In fact, some experts think mobile browsing may gallop past that estimate even faster. Our mobile web design company can optimize your website so that it ranks high in these mobile searches, which will point potential customers’ cars and feet in your direction. Helping customers to find your website on their mobile devices is just the first step. Getting them to stay with your site, to search through it and entice them to keep coming back is the next step. Our team of professional mobile web designers can make your website look, feel and perform wonderfully on a mobile device. When a customer has a good experience with your website, they are more likely to look to your business now and in the future when they need to purchase products and services. When you consider that only 2 percent of websites are currently optimized for mobile search, hiring a mobile web design company to get your website ready for mobile search instantly puts your business ahead of the pack. The typical mobile customer makes split second purchasing decisions based on their impressions of what they see on their smart phone. In fact, as of today, 66% of U.S. mobile device users employ their phones as shopping aids. Our mobile web design pros can help your website stand out from the competition so you can snag those customers before your competitors do. 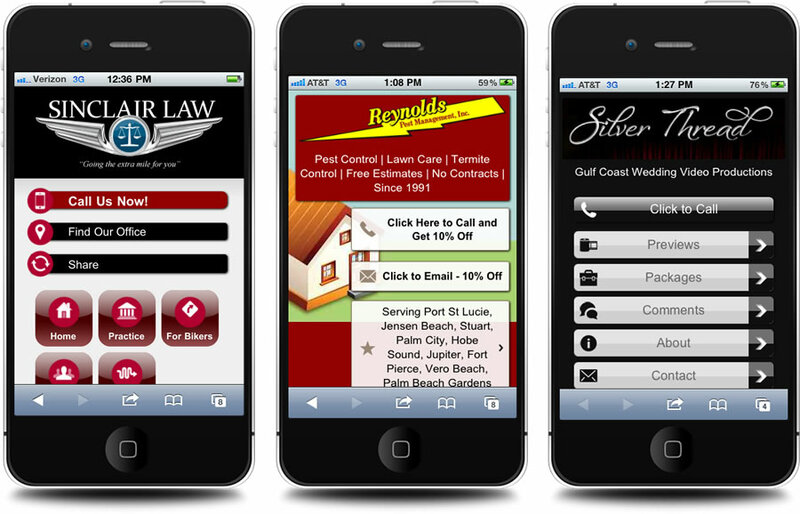 Our mobile web designers also make sure these great mobile-optimized websites are easily found in mobile searches. We register your website with mobile web search sites as well as GPS databases such as TomTom, Navmii, CoPilot. We also make sure your site appears in more than 30 premium online directories such as YellowBook, Yahoo, Superpages, YellowPages, etc. This ensures that no matter where or how potential customers are searching (either from a home computer or a mobile device), your website rises to the top of search results to draw in new customers and keep steady customers coming back. Click here to see our mobile web design packages.